We invite you to relax, rejuvenate and revive your spirit in a tranquil space where nature prevails. 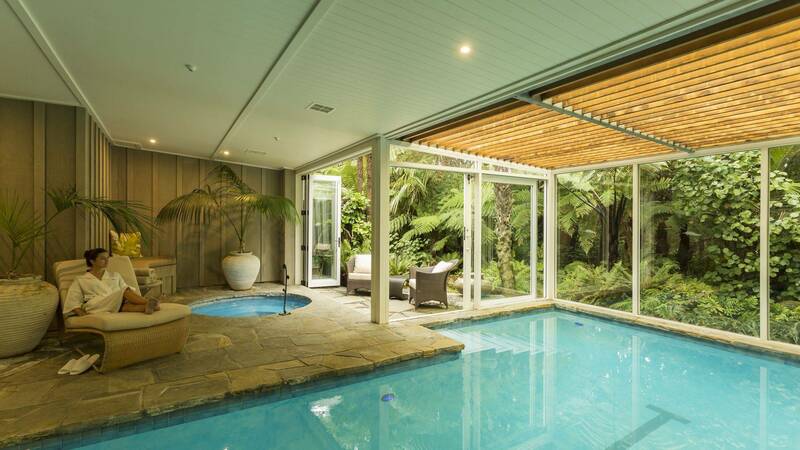 Our Spa is nestled at the edge of a Totara forest, overlooking a verdant fern glen and winding stream. 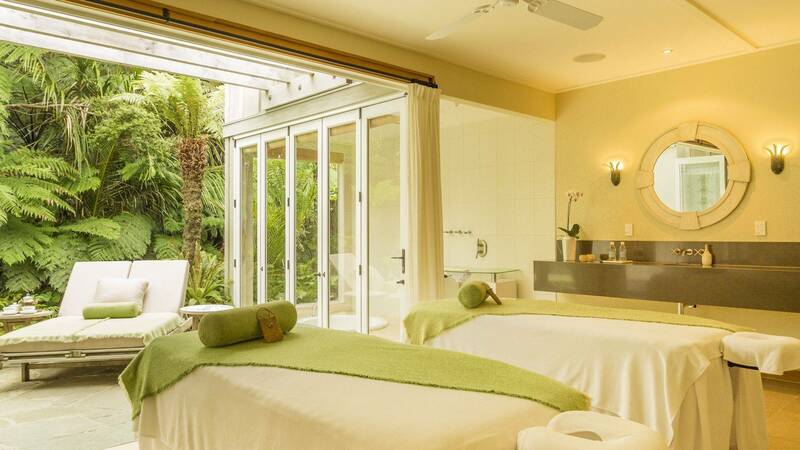 Each treatment room, including our couple’s room, has floor to ceiling views and opens onto a private outdoor patio with forest surroundings and native birdsong. The spa has four treatment rooms, locker rooms with showers, a sauna, Jacuzzi spa pool, indoor heated lap pool and fitness centre, with a range of exercise equipment and free weights. 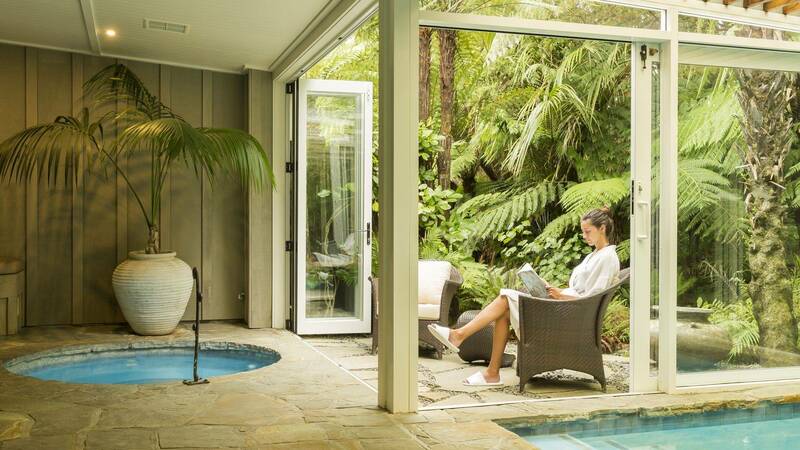 At Kauri Cliffs Spa, we are committed to providing quality treatments that are personalised to suit you. We offer a variety of services, including different styles of massage, luxurious facials, hydrotherapy, invigorating body treatments and elegant nail polish and designs. Would you like to know more about a spa treatment? Be prepared to be pampered as you experience a manuka honey scrub. Creamy manuka honey wrap and mini manuka facial. The treatment is very nourishing to the skin. 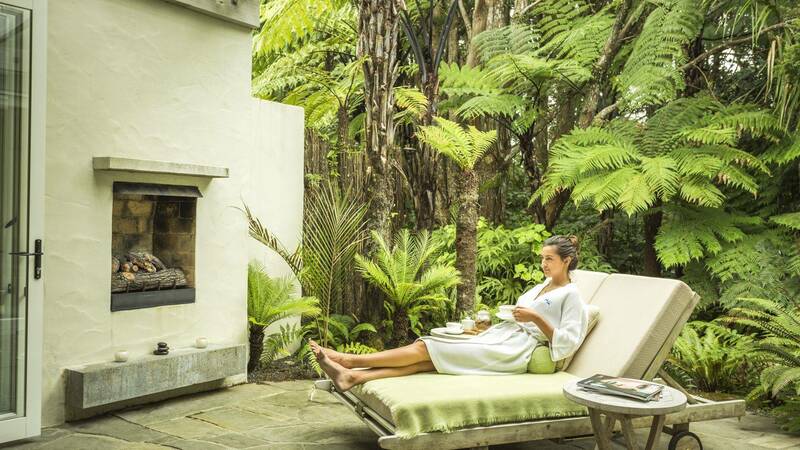 A detoxifying and nourishing body treatment which combines a rejuvenating exfoliation with the healing and remineralising properties of a pure Rotorua thermal mud wrap. We complete the treatment with a generous application of a nourishing body balm. Your treatment begins with a foot soak and full body scrub, followed by your choice of a relaxation or deep tissue massage using our Healing Manuka Balm. Hot compresses infused with essential oils combined with a back, neck and head pressure point treatment to offer relief from headaches, dizziness, tiredness, jetlag, sinus and stress conditions. 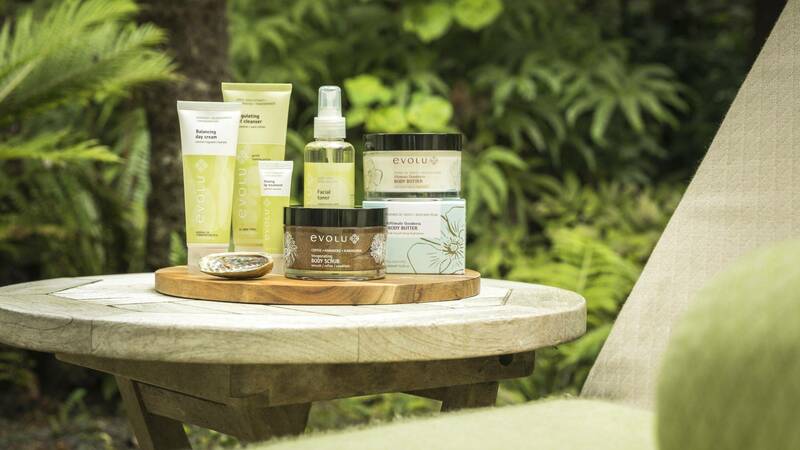 The botanical facial uses New Zealand’s own Evolu Botanical Skincare Range. A beneficial treatment which more than delivers its promise to restore balance to all skin types. Also available as an 90min treatment - $370. Treatment includes back massage. Utilising the rejuvenating and healing benefits of our locally made and harvested manuka honey we have created this beautiful facial which is suitable for all skin types and especially good for those who have been enjoying the outdoor elements. A nourishing and calming facial. Also available as an 90min treatment - $370. Treatment includes back massage. A classical facial treatment designed specifically to meet the needs of a man’s skin. Our gentleman’s is deep pore cleansing, balancing and nourishing. Warm compresses, combined with a scalp, face, neck and shoulder massage ensures total relaxation. Also available as an 90min treatment - $370. The ultimate treatment for those who want to see results! After a skin analysis your therapist will help you choose from our range of advanced skin care, the most effective products for your facial. Especially beneficial for those with problem skin, as this facial will be completely customised just for you. Also available as an 80min treatment - $375. Treatment includes back massage. 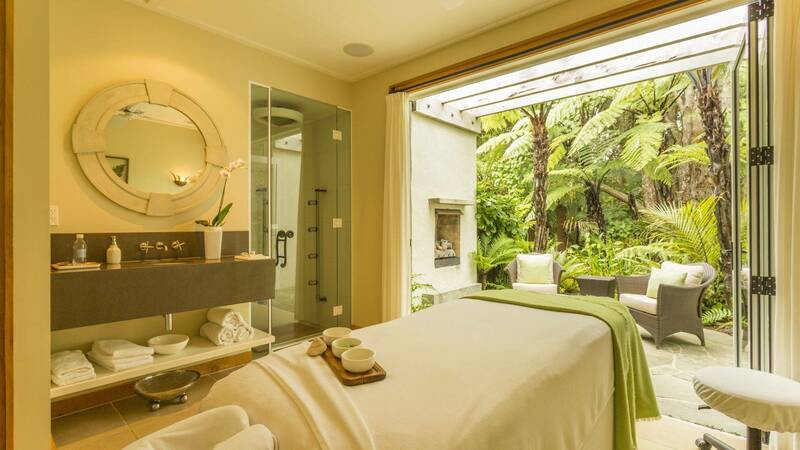 With special care, our relaxation massage is re-created into a fully supported spa experience for the mother-to-be who is in her second or third trimester. The massage is performed in a side-lying position, using pregnancy-safe products and techniques. Enjoy a relaxing foot soak, a stimulating scrub and a pressure point massage on the feet. If you prefer, a hands and scalp massage can be included in this treatment. Beginning with a light exfoliation, your fingernails are then shaped and cuticles trimmed. A nourishing mask is applied and your hands are massaged. Your nails are then highlighted with the finishing colour of your choice. Begin your pedicure with a relaxing foot soak and exfoliation. Nails are shaped, buffed and cuticle repaired before a moisture mask is applied. Unwind with a soothing foot and calf massage followed by your choice of polish. An express treatment designed for the quick repair of nails and cuticles of the hands OR feet. Cuticles are pushed back and nails are shaped and buffed or painted. A basic treatment to tidy and quickly improve the appearance of the hands AND feet. Cuticles are pushed back and nails are shaped and buffed or painted. A warm scalp massage can be incorporated into most 50 or 80 minute treatments to enhance your experience. An eye mask can be incorporated into most 50 or 80 minute treatments to enhance your experience. Manuka Honey Balm can be incorporated into most 50 or 80 minute treatments to enhance your experience. Private instruction is available on request and customised to your fitness level and offered onsite subject to availability of a trainer. Onsite bookings are on request and subject to availability of contract stylist. Offsite bookings at a local exclusive salon are available.